Kyobashi is a historic bridge that was built around the same time when Nihonbashi Bridge was built in 1603. 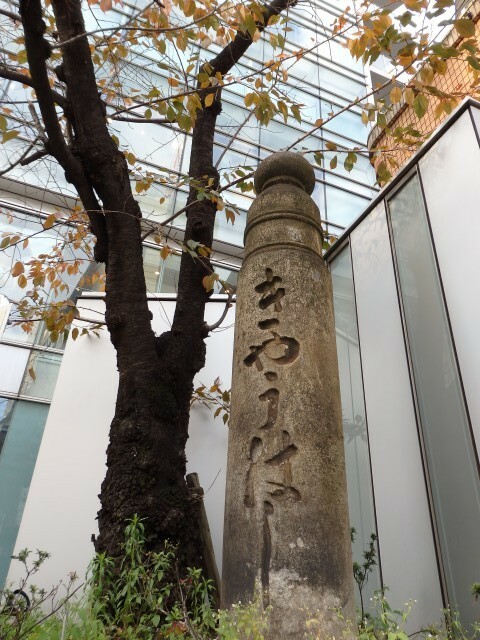 Although Kyobashi was removed due to land reclamation work along the Kyobashi River from 1963 to 1965, two stone pillars and one stone-concrete pillar remain as its vestiges. The two stone pillars were installed when a stone arch bridge was built as Kyobashi in 1875. The pillars take the form of a giboshi (bridge railing post knob) and follow the tradition of the Edo period with the characters “Kyohashi” written by poet Sasaki Shiin being carved as the name of bridge. The stone-concrete pillar was installed in 1922 during the extension work for building an art deco bridge. The pillar had a modern design with lighting facilities with the installation of a copper plate indicating that it has the name of bridge – “Kyobashi” and “Kyobashi” – and was “built in November 1922”.